An auction is ending in just a few seconds. You've been the high bidder for hours, indicating that everyone else has given up. You watch the seconds tick down into single digits. 5… 4… 3… and the thrill of winning swells in you. And then suddenly, the screen refreshes and you see, “You have been outbid – bid again before it’s gone!” But there's not enough time to enter a new bid before the auction ends. You lose, and you don’t know what happened. A “snipe” is what happened, most likely. Someone deliberately waited until the last second to place one bid exceeding the auction’s high bid, giving you no time to respond with a higher bid. Sniping can be done manually, by placing a bid in the usual way and sitting there, finger hovered over the mouse key that will send the final “confirm bid” acknowledgement and place your bid in eBay’s system. Sniping is so popular that eBay actually changed its bid-submission protocol to make it easier. But manual sniping is crude and unreliable. As the clock winds down, a crash in the kitchen and a toddler’s wail may distract, and you miss the end of the auction. Your Internet connection may choose that exact moment to stall or be lost completely. Your phone may ring. Someone may knock at your door. Lots of things can interfere with a manual snipe. Software can handle this problem. While you go deal with distractions, or just go about your life normally, a bid sniping program can sit there waiting for the precise moment before the auction’s end to submit your bid for you. Software can synchronize your computer’s clock to “eBay time,” which is really just National Time Service atomic clock time, so there is no win-ruining discrepancy between your PC’s clock and eBay’s. The catch is that you must give the software your eBay ID and password; otherwise, it cannot place a bid for you. Here we reach the big fork in the road: do you trust your eBay login information to a remote server, or only to software running on your local machine? It really doesn’t matter from a security standpoint. A program running locally can transmit your eBay login info to anyone, anywhere, and you will never know it. So the notion that “local is better” is an illusion. The advantages of using a remote service to place your snipes are real. Typically, a sniping service runs on a high-reliability server in a data center well designed to prevent downtime. It has a faster Internet connection than your consumer or small-business grade connection. It’s just more reliable than a locally running program. Google the phrase “eBay sniping service” and you will get a bewildering, large set of results. One says it’s totally free, but near the bottom of its laundry list of unfamiliar benefits like “multi-win group bidding” and “contingency group bidding” it says you’ll pay six bucks a year for “mirror service.” If you’re a casual eBay bidder, or brand-new to sniping, it can all get a bit bewildering. Q: How long have you used sniping services? A: Over ten years; when you trade actively, with many different buy/sell transactions going on all the time, it’s essential to have a sniping service take most of the load off of you on the buying side. Q: What sorts of things do you trade in? A: Since I started on eBay in April, 2002, I have dealt in everything from cloth diapers to high-end gems. I’ve even sold intangibles, like a PDF file containing woodworking plans for a rubber-band Gatling gun; that one was popular with grandpas, shop teachers, and Scout leaders. Q: Sniping services have some confusing jargon, such as “contingency bidding" and "multi-win". What do those terms mean, and are they of value to the casual bidder? A: A “contingency bidding group” is a group of snipes to be placed on identical or similar items that end at different times. If one snipe fails to win, the later snipes remain poised to place their bids. But as soon as a snipe wins, the remaining snipes are canceled. This allows you to set a group of snipes in which your maximum bid is pretty close to the starting bid. You – or rather, the sniping service – just keep trying to low-ball auctions until you succeed. It helps you pay the least you can. Using a “multi-win group" can help you win two or three of the same item; a multi-win group will not cancel remaining snipes until all of the auctions have been won. Q: What is “mirror service” and is it worth paying for? A: It’s not worth paying for, in my opinion. “Mirror service” means that your snipe is placed from two physical locations simultaneously, supposedly decreasing the chance that a snipe will fail due an Internet outage or server crash. But the risk is so small it’s not worth buying insurance against it. Q: Do you have a favorite sniping service? A: Bidrobot.com has been around for fifteen years. It has won awards for its reliability and customer service. It does contingency group bidding but not multi-win groups. But how often do you need three identical cameras? Its interface is pure HTML, no Flash or Java or other jazzy but unnecessary frills. I like simple when I’m doing business; if I want bling, I’ll go to MTV.com. Another nice thing about BidRobot is that it can delete your pending eBay bids with no penalty, which you can't do when bidding manually at eBay. Q: Any final advice for our eBay buyers and sellers? A: The winner of an auction is the one who pays more than anyone else thinks a thing is worth, for a thing the seller didn’t think was worth keeping. Can a Virus Really Destroy Your Hard Drive? Most recent comments on "Win More With eBay Sniping Services"
Your diligent work never surprises nor bores and is always educational. Thank you! But since the name of your website is "AskBobRankin"; I must pose the following burning question to you: May I ask how much total time (hours? days? )it has taken you to research, compile and post this specific topic. IMHO, it seems like there is a lot of Blood, Sweat and Tears involved in the final output(s)of your hard labor. 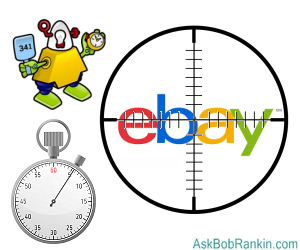 Although it doesn't mention sniping software, Ken Rockwell has put together a very good site called "How to Win at eBay" which discusses last second bidding. What happens when two (or 10 or 100) services snipe identical low bids one second before the auction closes? I have known about sniping but haven't bothered. If I'm the high bidder, I just put in another bid at the highest amount I'm willing to pay for an item. If someone else bids higher by sniping, it's OK with me, but often I'll end up getting it because my final offer (bid) is a little higher than what the snipers were set to pay. A long...long .. time ago I researched Sniping tools for Ebay and concluded most Sniping Services were too costly and they all required me to provide the Service with my Ebay ID and Password. I finally purchased Auction Defender, a software sniping program that runs on my own PC and I control my ID and PW. I set the [default] time of bidding, usually 8 seconds before the auction ends, and the program calls up Ebay and posts my bid at the selected time. Over 1000 successful Ebay transactions later I am quite happy with Auction Defender. It is frequently updated, and gives me ALL the functions offered by the best of the Sniping Services ... but it is all within my control. The initial cost of the Auction Defender software is $15, with an annual licence fee of $10. The only weakness that I have found is that the PC must be ON when you want to bid, otherwise it is just set & forget. 1. Look up the Ebay incremental bidding amounts, don't bid in even dollar amounts, set your maximum bid at a slightly higher amount. 2. When you first see the item you want listed, and if there are no prior bids, place a low manual instant bid via Auction Defender and then let the AD system monitor the bidding. If you really want the item, do some research on the other bidders and try and work out their intentions and bidding methodology. 3. In the event of equal bids the earliest placed bid will win the auction .. so place your [maximum] bid a little earlier, but too late for the manual bidders to respond, & let the snipers bids work their way through the system. 4. If the is a "newbie" bidding repeatedly on the item with a sniping tool [check the auto/hidden bids] then he/she probably has 'auction fever' and will be determined to win 'at any price'. 5. DO NOT EVER place an extremely high [max] bid thinking you will outbid everyone. Another sniper or newbie may do the same and the end price can end up absurdly high, leaving you with the bill. 6. Understand that the highest bid will ALWAYS win the auction ... so only bid the maximum amount you are willing to pay. I thoroughly recommend Auction Defender to anyone bidding on Ebay. For those of us who have come across a listing for an item you really want, but the listing states no international postage, there are very cost effective ways around this too ... but maybe this is a subject for another day. Good article, Bob. I started to sign up for a sniping service a few months ago, but when I got to the part that they wanted my eBay password, I stopped. Of course they can't bid without it, but I have trust issues. Imagine a hacker getting into their databases! You've listed the disadvantages of trying to snipe yourself, but that's half the fun of it. If you want something bad enough, just put in a high bid, then see if they snipe up to it. It's just like a live auction- you can get caught up in it, and bid too high yourself. When I sell something, especially electronics, I love snipers. I've seen items double in price in the last minute. Win some, lose some. I see no need for a sniping service nor program. Basic ebay service has autobidding up to max bid you enter. So I just make my bid in last seconds with maximum price I'm ready to pay and don't care if I win. If somebody else wins - he or she will pay a price I wouldn't pay, so go ahead. The only drawback is that you have to be near computer at the moment of auction and your software and hardware should work fine. But since I don't buy unique pieces of something, like art, I always can find another auction with the same item. So what the point to pay extra for a service that brings you so little? I personally see win-win situation here - you have two options only - to win an item or to save your money. I have always done it manually. I first work out the highest price I'm prepared to pay then close to the end of the bidding I have the same page open in two tabs. on one page I have my bid all set up with the highest price I'm prepared to pay and so that I don't want it to move close to that price I don't bid till the latest I think I will wait. On my other tab I keep refreshing the page to watch Ebay time and the last thirty seconds I switch to my page that is set up to bid and I bid. Yes someone with a sniping service will probably beat me but that's life, not everyone uses a sniping service. I just bid anytime during the auction with the highest price I'm willing to pay. If I win, I got it. If I don't win, it was overpriced anyway. I use a snipe program multiple times a week. My personal favorite is EZ Sniper. They have a low fee that only applies if you win the bid. Various people mention that they don't understand why they should use one. I don't want to put in a bid early in the auction because it shows my interest and it runs up the bidding amount way before the end of the auction. Many times the auction is ending while I am at work, or sleeping, or have a meeting, or...... With a snipe service, I can set my bid when I first see the item. I determine my top bid, enter the amount and then forget about it. If I win, the snipe service notifies me. And because I'm not showing my hand early, other people interested in the same item don't know there is other interest and they aren't as likely to raise their maximum. This is especially useful for those items where only 2-4 people are likely to bid. I have forever done it manually. I initial compute the very best worth i am ready to pay then near the tip of the bidding I actually have a similar page open in 2 tabs. on one page I actually have my bid prepared up with the very best worth i am ready to pay so that i do not need it to maneuver near that worth i do not bid until the most recent i feel i'll wait. On my different tab I keep refreshing the page to look at Ebay time and also the last thirty seconds I switch to my page that's got wind of to bid and that i bid. affirmative somebody with a sniping service can in all probability beat ME however that is life, not everybody uses a sniping service. Now i am using Segbay App as a eBay Bid Sniper in mobile to keep the track of my all the bids, and the most impotently it is free of cost. Every one download it for free and use in own iPhone or Android.